Chipotle BBQ hamburger recipe. An excellent way to season hamburgers with the flavors of the southwest. Chipotle BBQ hamburgers, the spice of life. We know a few great ways to make burgers as we love hamburgers and their versatility . 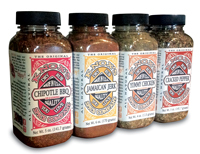 But the first choice of grilling season was Chipotle BBQ Burgers make with Knox's Chipotle BBQ dry rub seasoning. First we prepared the grill with Mesquite lump charcoal. The flavor of any hardwood lump charcoal is a compliment to the flavors of the burgers. Then take about 2 pounds of ground beef and 2 tablespoons of Knox's Chipotle BBQ dry rub seasoning. Mix together. The smoky smell of the Chipotle is a teaser, just wait. Make patties and put aside. Also try this recipe using ground Buffalo. When the grill is hot, flatten out the coals. Toss those patties on an oiled grill and prepare yourself for the smell of hamburger that will have your neighbors curious. As the spices warm up and release aroma, the smell blends with the cooking burger and mesquite. It is excellent. Grill for about 4 or 5 minutes per side. Do not press the burgers. Pressing them squeezes out succulent juices and flavor. When done grilling garnish with lettuce, tomato and onion and sit down to a plate of grilling heaven. For a big flavor experience try topping this burger with jalapeno peppers and onion rings or fire roasted California chillies. Mix together and chill. The mayonnaise will take on a brownish color because of the Chipotle and Guajillo peppers but the flavor is not a dull one. Smooth creamy mayonnaise, smoky aroma and a spicy bite all in one shot. This blend makes a hamburger more like a steak burger. The earthiness of the cracked pepper compliments the flavor of the ground beef and do not underestimate the heat of cracked pepper. This burger has a bit of bite.